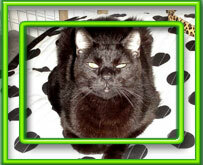 View our happy endings for some of the cats and dogs that S.A.V.E. has found homes for. This is just part of the work that S.A.V.E. 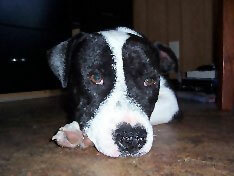 is part of in helping to improve the lives of animals. 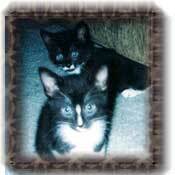 Hope and Ali were rescued from an abandoned house. It took quite some time to get them to trust us… now, Hope and Ali are being well taken care of and they love playing and sunbathing in their outdoor enclosure. Sky had never been on a leash, in a house, and was obviously allowed to dig in the garbage for his food! He was not neutered and crawling with fleas. It took a lot of patience and work to rehabilitate him however he now sleeps right by the bed of his new owner, walks on the leash without stress, and has other dogs to play with! From the new mom: “This picture shows how he spends his time while I am on the computer. Licorice was born two days after we spent the entire night humanely trapping an entire feral cat colony which was being targeted by cruel cat hating fraternity wimps who had already shot one kitten & lit another cat on fire. The latter was brought to the emergency & had to have her tail amputated. She was later adopted by our good friend who runs the local Humane Society. These cute little kittens were surrendered to S.A.V.E. by their owners. They were miserable as they were infested with fleas and had bad worms. After being nursed back to health, they were both adopted to a very good home and are being SO spoiled! S.A.V.E. rescued Rufus as he was running on I-10 in the middle of the night. His entire body was covered with fleas and ticks; he had worms and was coughing. Rufus is now part of a wonderful family with two young boys and a stay-at-home mom, therefore he is rarely alone and gets cuddled all day long! Cassie has now found a good home with the help of S.A.V.E. We hope Cassie will have a long and happy life with their new owners. Sunny was adopted to a great family. John (his adoptive dad) takes him to work sometimes. And he goes with Elizabeth (his adoptive mom) to drop the daughter off at school every morning. To see more happy endings, click here!